The burgeoning contactless infrastructure will boost adoption. More than half (53%) of global point-of-sale (POS) transactions will be contactless in the next five years, compared to 15% this year. This is according to a new research report by Juniper Research, titled POS & mPOS Terminals: Vendor Strategies, Positioning and Market Forecasts 2017-2022. The report predicts contactless payments adoption will rise sharply over the next five years, specifically in the US, where it is expected to rise from less than 2% of transactions this year to 34% by 2022. Contributing factors include customer dissatisfaction with the slower speeds of chip card transactions, allied to the burgeoning contactless infrastructure, which would provide further impetus for smartphone-based payments currently dominated by Apple Pay, adds the report. Dr Windsor Holden, research author at Juniper Research, explains: "While US card issuers haven't yet made contactless a priority, the extremely positive response across Europe, both from merchants and consumers, suggests the US would see very rapid migration at POS if and when contactless cards become mainstream." According to the research, in markets where contactless has been heavily promoted, such as Poland and the UK, adoption has soared, while mandates from Visa and MasterCard mean all POS terminals in many markets must be contactless-enabled by 2020. 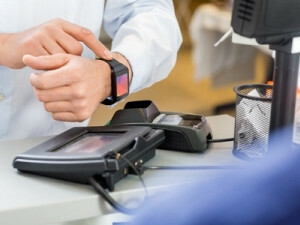 Juniper further anticipates that smaller merchants will increasingly embrace mobile POS accessories, which facilitate payments via a connection to a mobile device, as competition in the space intensifies. First National Bank's (FNB's) credit card division says its credit card-holders and merchants are increasingly opting for contactless payments when conducting transactions. The number of contactless transactions by customers increased from 1.5 taps per month in May 2015, to an average of 2.5 per customer by January 2017, according to FNB. "Contactless payments create a convenient and secure payment environment for both customer and merchant. The adoption of new payment technology is almost always accompanied by a degree of scepticism, but this is where customer education plays an important role to ensure there is a level of comfort," says Gareth Rimmington, head of operations at FNB Credit Card. Analyst firm Berg Insight's report, titled: POS Terminals and Wireless M2M, predicts the global installed base of near-field communication-ready POS terminals will grow at a compound annual growth rate of 17.9% from 45 million units in 2016 to 86.9 million units in 2020. The report further estimates that approximately 15 million POS terminals accepted contactless payments with Visa payWave, MasterCard PayPass or UnionPay Quickpass in mid-2016. "The mobile POS terminal market is growing faster than the traditional POS terminal segment and there are more than 80 vendors active in the global market today," says Johan Fagerberg, senior analyst at Berg Insight.